Brian and I have never ventured to Costco together before. In fact, it has been a full 3 years since I have stepped foot in one. Walking towards the door, I challenged Brian with the age old Costco question, "Cart or flat bed?" He scoffed at me like it was an absurd question and said, "Cart." No! Wrong! All wrong! Everyone who grew up taking that monthly (sometimes bi-weekly) trip to Costco knows you go for the flat bed! Its the only time you can acceptably be pushed around a store as a gangly 10 year old. Sitting in a cart at 10 or 11 is just embarrassing and you don't have room for snacks when your body is all contorted in the basket taking up all the potato chip room. Anyway, that's my rant on that situation. There is of course another Costco situation that I am sure we are all familiar with, and one that we will never outgrow. The dreaded, "I will buy it if you finish it" conundrum. We all know it! I am sure we drove my mother mad, running up and down all the aisles, "Can we get this? And those? Oh I love these! Can we get 'em? Pleeeeeaasseee? But, Mom!" Her usual response was something along the lines of, "You won't eat ALL of that." And you know, she was right. Nobody needs fourteen bags of Honey Bunches of Oats, or 68 Power Bars, or like the mistake I just made at Costco, a bag of 24 lemons. You. Just. Don't. Need. That. Much. I hate wasting food, but even more I hate overpaying on my produce. Costco is a dungeon of Catch-22s. I got that bag of 24 lemons for the price of 4 in the grocery store, so naturally I had to have them because of the deal. I swore I would use them all. I swore. Nope. It's just not possible. Even if you eat one a day, squeeze it in your water or over a salad, or whatever, you just can't use 24 of them before they start to wrinkle, look sad, and start to take on that bitter taste old lemons do. So I had to bake with them. But here is the other issue... most recipes cannot take more than one lemon (maybe 2), because they are so potent in flavor and too much juice ruins batters. Let's just say you may be seeing a lot of lemon recipes in the next couple of weeks. Sorry. Not sorry. I think the moral of the story here is that you should only buy paper towels, toilet paper, and laundry detergent at Costco. Everything else is trap! 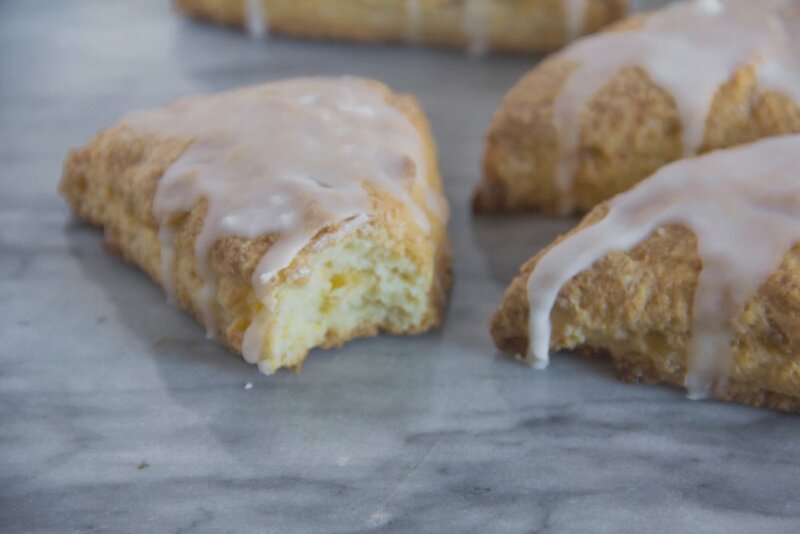 This lemon ginger scone recipe is inspired by one of my fave scones from Flour Bakery here in Boston. It's tart. It's sweet. It's got a touch of spice. It only uses one lemon, so don't buy Costco lemons. Just a friendly tip. Preheat oven to 400*F. Line a baking sheet with a silpat or parchment paper and set aside. In a large bowl, whisk together the flour, sugar, baking powder and soda, and salt. Using your fingers or a pastry cutter, cut the butter into the flour. If using hands, pinch the butter into the flour over and over. Stop once the flour mixture resembles bread crumbs. Mix in the ginger and the lemon zest. Using your hands once more, mix in the buttermilk until you have a shaggy dough. Turn the dough out onto a well floured surface and knead a few times, only until the dough just comes together. Pat the dough out to a round about 1 inch thick. Cut the round into 8 triangles, and line each of the triangles up on the prepped baking sheet. Bake for 20-25 minutes or until the tops are a light golden brown and the edges are slightly darker. Allow to cool for a few minutes on the pan, then transfer to a cooling rack to finish cooling. Make the icing by whisking together the powder sugar and the lemon juice. Pour over the top of the cooled scones and allow to set up before serving.